In June 1789, Governor Arthur Phillip and a small party of 40 men made the first European exploration of the Hawkesbury River. Governor Phillip named the river after the British Statesman, Lord Hawkesbury. The purpose of the trip was to find suitable farming land for the infant colony. The first European settlers arrived a few years later and by 1796 over a thousand acres were under cultivation. In 1810, Governor Macquarie began the task of marking out five new towns in the Hawkesbury area. 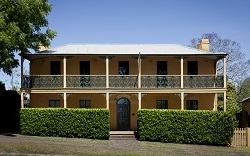 Part of Macquarie's brief was to take measures to prevent further losses of food stores, buildings and possessions caused by devastating floods which had plagued the Hawkesbury since settlement in 1794. Macquarie gave these instructions high priority and with planning foresight established the townships of Windsor, Richmond, Wilberforce, Pitt Town and Castlereagh. If you want to immerse yourself in the European history of the area we have a number of resources to help you to explore. These walking or driving suggestions take from 1 hour to 4 hours to complete and you can go at your own pace. Feel free to download them and explore at your own pace. Brand New Heritage Highlights Booklet! The brand new Hawkesbury River Towns Heritage Highlights booklet has arrived! Complementing our popular Richmond Heritage Highlights and Windsor Heritage Highlights this new booklet covers Wilberforce, Pitt Town, Ebenezer and Wisemans Ferry. If you have limited time to explore these towns these handy booklets go through some of the best heritage buildings along the river. 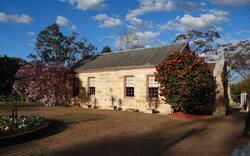 The booklets are available from the Hawkesbury Visitor Information Centre at Richmond, Hawkesbury Museum at Windsor and libraries at Windsor and Richmond. Alternatively you can download them for free below. 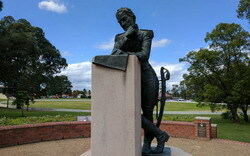 This self drive tour explores the Hawkesbury through the eyes of Governor Lachlan Macquarie. 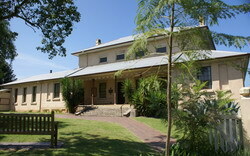 Macquarie was instrumental in laying out townships in the district in the early 1800s. The free Colonial Heritage of Western Sydney app explores the rich history of Hawkesbury, Penrith, Liverpool and Camden local government areas. 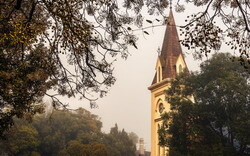 This region includes the largest group of early colonial European heritage assets in Australia and the app details many historical buildings, farmhouses, churches, cemeteries, roads and bridges. Developed by Hawkesbury, Penrith, Liverpool and Camden Councils, the smartphone app is available to iTunes, Android or GooglePlay users and can be downloaded now.